Maximize the performance of your workholding, and expensive lathes, by ensuring proper chuck function. The most expensive lathe will not perform at its best if the chuck is not giving full grip force. 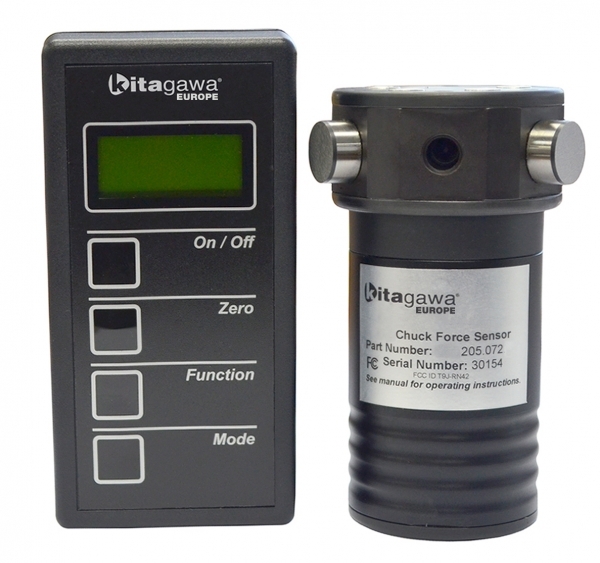 Kitagawa Europe’s wireless grip force meter is designed to quickly and accurately measure holding force and chuck speed. Used for static or dynamic testing. Sensor models are available in two sizes: 72 mm and 125 mm. Can be configured for 2, 3, or 4 jaw operation by installing rest pads in the appropriate locations. To measure large diameter chucks, extension rings and specialty jaw rest pads are available. Chuck gripping force is quantified, thus improving quality control and safety! Integrated detector and display. Easy to handle with low weight.